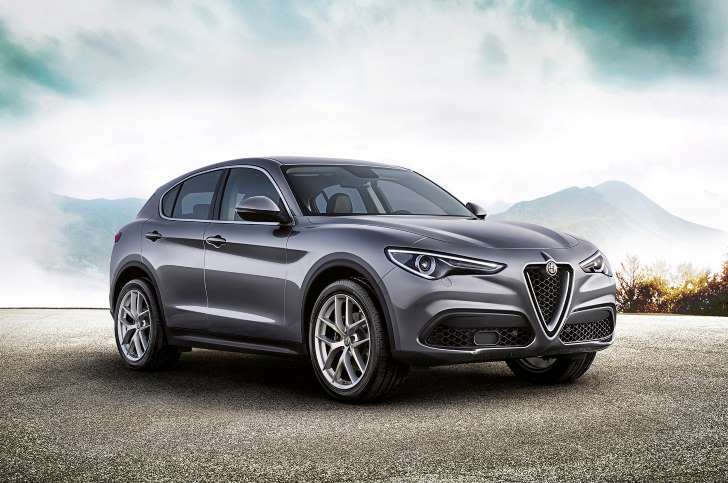 Alfa Romeo debuted the Stelvio SUV at the Los Angeles auto show, but up until now, we’ve only seen the range-topping Quadrifoglio model. Now, Alfa Romeo is showing off the less powerful, but equally stunning, Stelvio First Edition. Available for order now in Europe, the First Edition gives us a glimpse of what we might expect from lower-performance Stelvio models. Along with standard all-wheel drive, it features a 2.0-liter turbocharged gas engine delivering 280 hp and 306 lb-ft of torque. According to Alfa, the model should hit 62 mph in 5.7 seconds. Top speed is 143 mph. Twenty-inch alloy wheels, bi-xenon headlights, colored brake calipers, chrome-plated window frames, and courtesy lights on the door handles are some of the exterior niceties of the First Edition. Inside, look for heated leather seats, real wood accents, a 7-inch digital instrument cluster, 8.8-inch infotainment display, and 3D navigation. Standard safety features include forward collision warning, integrated braking system, autonomous emergency braking, and lane departure warning. Parking sensors, a rear camera with dynamic guidelines, and power-operated tailgate complete the equipment. Alfa Romeo will also offer an upscale Ti model, available with Sport and Lusso packages. Quadrifoglio models receive carbon fiber interior trim, special performance seats, an upgraded V-6 engine, a standard adaptive suspension, and a Race mode. The automaker has said that the Stelvio Quadrifoglio will go on sale in the U.S. during the second quarter of 2017. The SUV might not be available in the U.S. yet, but Alfa Romeo just brought over the new Giulia sedan to our shores last month. Both models sit on the automaker’s new Giorgio platform.